Working in the tourist industry I can see we know quite a few of the roads. In a country the size of West Virginia I can assure you though that there are always new roads and it would be almost impossible for somebody to know all the roads of Costa Rica with all the hills and mountains. The roads in Costa Rica is what gives a student travel trip or a Costa Rica vacation that extra bit of adventure. Roads that look as if they lead to nowhere can open up to some of the best scenery you can imagine. In the last few years Costa Rica has done an incredible job of fixing up roads all over the country from the long coastal straight roads to the high mountainous roads it seems all are better than what they use to be. Just like any place on Earth mother nature can takes its toll on a road. With detours needed you can see in the picture above that arriving to the river for a day of rafting we had to have the clients hike 1 km which is not that bad and like I said added to the adventure because a road was out. It is best that on a Costa Rica vacation or a student travel trip to Costa Rica you dont let any of this bother you and you just roll with the bumps in the road. I often tell clients that people that work in the coffee fields or sugarcane might have to walk 10 km each way to then work in the hot sun for 10 hours. This is nothing compared to hiking a bit to enjoy a sunny day rafting in one of the most beautiful rivers in the world. The famous Caldera highway just opened up in 2010 and literally cuts about an hour off your time driving from San Jose to the Pacific coast. 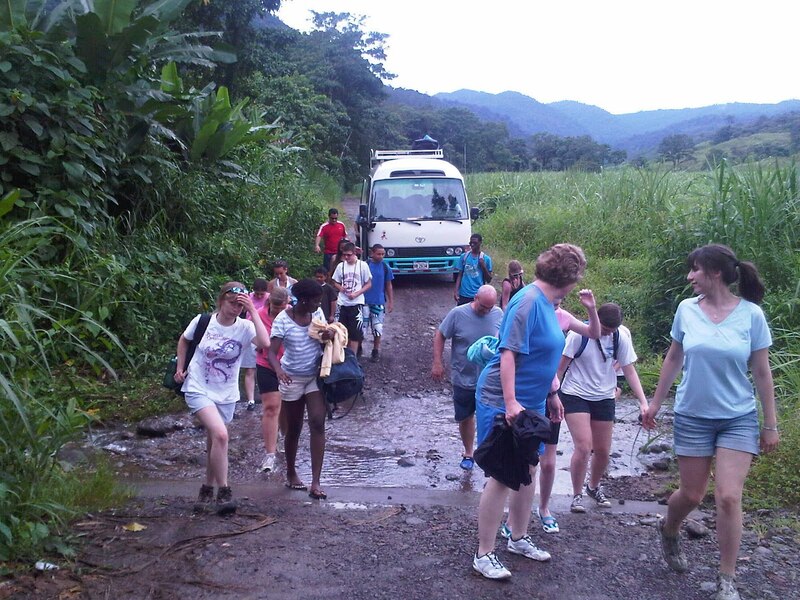 For a Costa Rica vacation or a student travel trip this can really help out in the different activities we do. It turns out that they had to close the road to continue working on it because rocks were falling in the lanes. I heard comments from Ticos talking about how bad a road it is and that this would never happen in the USA. Well I have news for them. Driving on roads in the USA I know plenty of places that have signs that say "Warning Falling Rocks". Although I agree the road might need a little extra work it is still an extraordinary accomplishment for a developing country to have such a nice road out to the beach.